We feel your pain. End the madness. 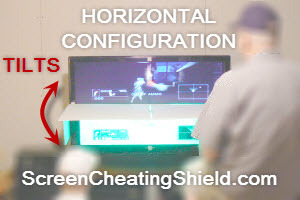 Prevent & stop multiplayer split screen cheating (AKA screen looking, screen watching, screen peeking, screen jumping, screen hopping, screen checking, screening) with the Screen Cheating Shield. Let's face it-- cheaters gonna cheat! Oh sure, they try to justify it by saying, "It's all good, you can see my screen too, bro." Yeah right, we know they've been up all night studying the maps... Well, it's time to really level the playing field and see who has skills. Heretofore, we will no longer accept fraudulent defeat from our little brothers, lazy sons, best friends or deadbeat suitemates. 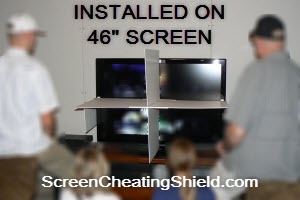 Now is the time to unite to stop this growing scourge known as screen cheating. Together, we can help suffering noobs everywhere get a fair shake. 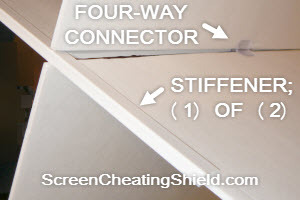 Join with us now, and buy a Screen Cheating Shield as a gift for the cheaters in your life! 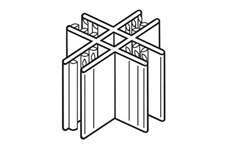 DESCRIPTION: The Screen Cheating Shield Hardware Kit simplifies construction of a quality shield for use on your screen. This shield splits your screen into (2), (3) or (4) viewable regions. By creating separate viewing regions, cheaters are prevented from looking at another player's HUD and location and from gaining an unfair advantage; in other words, cheaters are forced to see if they actually have any real skills. Our kit fits all screen widths and heights; you are only limited by sagging in your horizontal panel(s) at long lengths. You provide panel(s) approximately 1/8" thick made from cardboard or foam board (available at dollar type stores); we recommend using foam board since it is lighter and stiffer. Typically, 60" is the maximum width we recommend if both the lower and upper partitions are not used, since they serve to support the horizontal panel. For the (2) Team Horizontal arrangement, tilt angle is adjustable up and down. The panel(s) can be removed from the hardware between games for normal screen viewing. 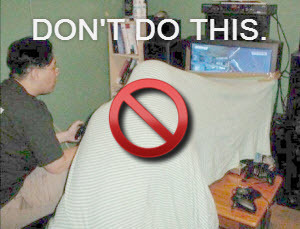 USAGE: During play, gamers using the (2) lower regions of the screen sit in the middle and nearer to the floor (maybe in a beanbag), and the gamers using the (2) upper regions of the screen sit on the outside and higher up. (4) panel anchors with adhesive. (1) set of assembly and usage instructions. 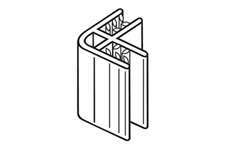 Panel(s) approximately 1/8" thick with the height and width and depth that you require. Panels may be cardboard or foam board (recommended). Rubbing alcohol to clean perimeter surface of screen to receive self-adhering panel mounts. (2) pieces of tape to secure horizontal outriggers. Straight edge and blade or shears to cut panels to needed sizes. SIMPLIFIED INSTALLATION INSTRUCTIONS: Clean perimeter of screen with rubbing alcohol. Center and attach (1) mount on each side of viewable screen. Cut panels and connect using couplers and connectors. Insert panels in mounts. Secure outriggers to screen perimeter using two small pieces of tape. INSTALLED DIMENSIONS: Typically, up to 60" width is recommended. Panel height is not limited since vertically hung panels don't flex under gravity. Usually, 10" to 20" deep panels are used. Ultimately, you choose panel sizes. 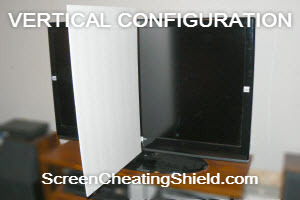 RESTRICTIONS: All configurations fit flat screens. Kit is designed for 4-way configuration, but some hardware will not be necessary if 2-way or 3-way configuration is chosen. 2-way horizontal configuration will only fit flat screens. 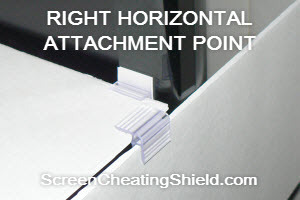 2-way vertical configuration will fit both flat and curved screens, but trimming is required to accommodate curvature if used on curved screens. NOTES: Cutting and assembly required. Installation requires that hardware with adhesive backing be applied to your screen perimeter. (2) pieces of tape to secure horizontal outriggers will be applied to your screen perimeter. 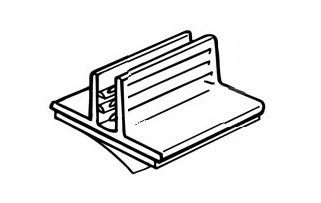 Adhesive on the back of the anchors is typically single-use, so removal may ruin anchors. Anchors can be made black using a Sharpie prior to attachment to your screen perimeter if aesthetics are important. Ordering: Online Credit/ Debit Card payments and Paypal.com payments are the only forms of payment we accept via our secure third-party shopping cart. Money orders, cashiers checks, personal checks and cash are not accepted. Shipping & Tracking: Orders are ordinarily shipped within three business days. Orders received after 1500 EST are treated as if they were received the next business day. Only continental USA orders are accepted at this time. If more than one item is ordered, all items will be shipped in the same package if possible. Orders are shipped by UPS and USPS. Tracking numbers can be provided by email after the order has been shipped. Orders are always shipped by USPS if a US Post Office box is used as the shipping address. Expedited shipping is not available at this time. Guarantee & Returns: With your purchase, you receive a 7-day money-back guarantee. Defective products will be replaced or refunded according to your choice. Other products must be returned in "as-new" condition and a US$4.00 repackaging and restocking fee will be deducted from the refund. Shipping fees are not refunded. If a returned product is not defective and has clear "wear and tear," the refund will reflect deductions accordingly. To process a return, please repackage the item with all parts. Include a note explaining the reason for the return. If the item is defective, note why it is defective, and specify whether you would like a refund or exchange.